Polyurethane properties are tailorable over wide ranges of hardness, resilience, spring rate and dynamic properties. For each application, certain physical properties take priority in meeting the application’s performance requirements. Urethane’s versatility offers custom solutions to difficult design challenges. Hardness is the relative resistance of a surface to indention under a specified load. 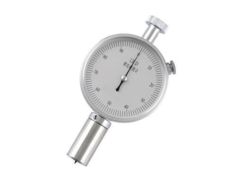 The most commonly used measuring instrument is a durometer tester. Hardness is expressed through a numerical value derived from the depth of penetration. The harder the sample, the higher the value. Polyurethanes can be formulated to cover a wide hardness range, from 20 Shore A to 85 Shore D. Most rubbers have a hardness that is typically found between 30 and 80 on the Shore A scale, and structural plastics begin at 55 on the D scale. Argonics polyurethane bridges the rubber-plastic hardness range with formulations available from a 52 shore A to a 70 Shore D and is suitable for a variety of applications. The outstanding abrasion resistance of polyurethane has changed the way people address applications where severe wear is a problem. Polyurethanes show a definite improvement in wear life over other materials in field and laboratory tests. Abrasion or wear can occur in a variety of ways due to the stresses experienced through sliding action or high or low impingement wear. This is an important thing to keep in mind when considering abrasion resistance claims from urethane manufacturers. Laboratory abrasion test results will never directly correlate with expected service performance. Argonics uses a DIN Abrasion tester to compile our statistical abrasion results as it is a trusted and accurate test method. The ability of polyurethane elastomers to sustain higher stresses is one of their outstanding characteristics. Some plastics have high modulus and tensile strength, but low elongation. Most rubbers, on the other hand, have high elongation but low modulus and tensile strength. Polyurethane elastomers have high modulus, high tensile strength and high elongation. This combination imparts toughness and durability to the cast urethane part. 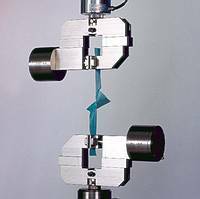 Elongation or strain is the extension between benchmarks produced by a tensile force applied to a specimen and is expressed as a percentage of the original distance between the marks. Ultimate elongation is the elongation at the moment of rupture. Modulus is the stress in pounds per square inch (of original cross-section) required to produce a certain elongation. Tear strength is a measure of how well a material can withstand the effects of tearing. 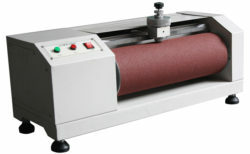 More specifically, however, it is how well a material resists the growth of any cuts when under tension. In most applications, tear strength is the physical property most indicative of impact abrasion resistance. Due to the nature of their chemical composition, polyurethanes possess an advantage over conventional rubber materials. Resilience/Rebound is defined as the ratio of energy given up in recovery from deformation to the energy required to produce the deformation. Many urethane elastomers maintain their resilience with changing temperatures far better than other rubbers through the range from 32°F to 200°F. This stability of polyurethane is valuable in certain dynamic applications such as springs and shock mounts. This property is also the main contributing factor that manifests itself as the ability to resist abrasion much better than steel or rigid plastics. The most widely used methods for measuring resilience by impact involve rebound in some form. 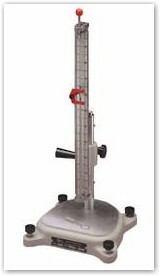 The Bayshore Resiliometer quickly and accurately measures the height of rebound. Compression set is the characteristic of an elastomer to remain permanently deformed after deforming forces are removed. Compression set testing results are measured as a percentage of the deformation that does not recover in a specified amount of time. The lower the percentage, the better the material resists permanent deformation. Thermal conductivity is defined as a measure of the ability of a material to transfer heat. It is the heat energy transferred per unit time and per unit surface area, divided by the temperature difference. Heat build-up in urethane parts occurs when a part is subjected to flexing or cycles of compression and tension. The heat that is generated will usually result in the premature failure of the product. Because of the low thermal conductivity of polyurethane, the heat developed by internal friction cannot readily be dissipated. 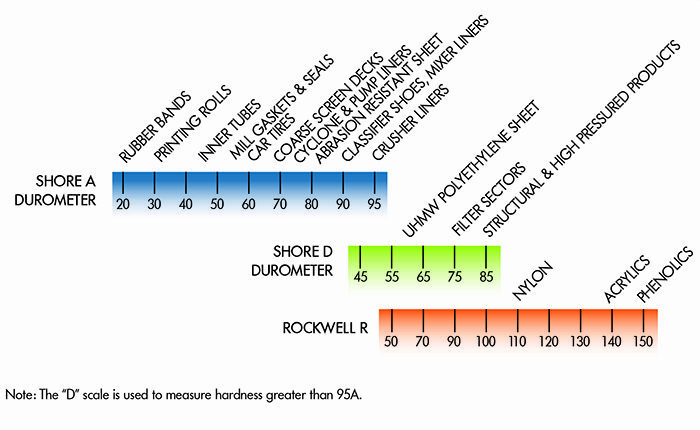 The effect of heat build-up or hysteresis is a very important consideration when designing parts with urethanes. The effects of heat buildup can be counteracted by choosing the proper polyurethane formulation and in the proper part design. The coefficient of thermal expansion is the ratio of the change in length per degree to the length at 32°F. The coefficient of thermal expansion varies with temperature. The expansion of all rubbers is of the same magnitude, approximately 10 times that of structural steel.